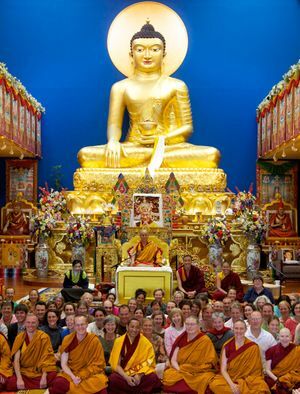 From May 25 till June 5 2010, Khenpo Pema Sherab taught on Mipham Rinpoche’s ‘Beacon of Precious Certainty’ at Lerab Ling. Khen Rinpoche taught directly on the root verses, using the structural outline of a commentary by the great Khenpo Jamyang Drubpé Lodrö. He completed teaching on the third question, and began to teach on the fourth. Lopon Sonam Tsewang gave clarification sessions every afternoon. His meticulous, confident and patient manner made it possible for students of disparate backgrounds to improve and check their understanding of the teachings. During this visit, Khenchen Pema Sherab also began teaching the Lerab Ling monastic community and on the last day he gave the lung for the ‘Beacon of Certainty’, as well as for the text ‘Ascertainment of the Three Types of Vows’, concluding with some heart advice to the Sangha. There he stressed the importance of the monastic tradition and reminded us that what’s most important is the good qualities that manifest in the students through their genuine study and practice of the teachings. Khen Rinpoche has kindly agreed to return and continue teaching on the same text in the next years. This page was last edited on 13 July 2010, at 17:05.